The highest practical level of the IRATA scheme. Qualifes the holder to implement and supervise a safe system of work in any type of rope access work situation. The IRATA level 3 qualification is a recognised qualification for supervision of any rope access workplace. Advanced course allowing supervision of a wide range of work sites. Candidates must possess an IRATA level 2 certificate. IRATA Rope Access Supervisor course contains theoretical content including detailed knowledge of applicable legislation, competence in inspection and care of equipment, casualty care, risk assessment and method statements and site management requirements. Candidates must be an Intermediate IRATA qualified technician with a minimum of twelve months and 1000 hours work experience (verified by an IRATA logbook) at level 2. Candidates with less experience who work in specific environments such as Cleaning or Geotechnical may wish to consider ISO Rope Access Supervisor (TRA1S) course. A level 3 Supervisor is capable of site supervision for rope access work projects and be conversant with relevant work techniques and legislation. They should also be able to demonstrate all the skills and knowledge required of IRATA Rope Access Level 1 and Level 2 and have a comprehensive knowledge of advanced rescue techniques. 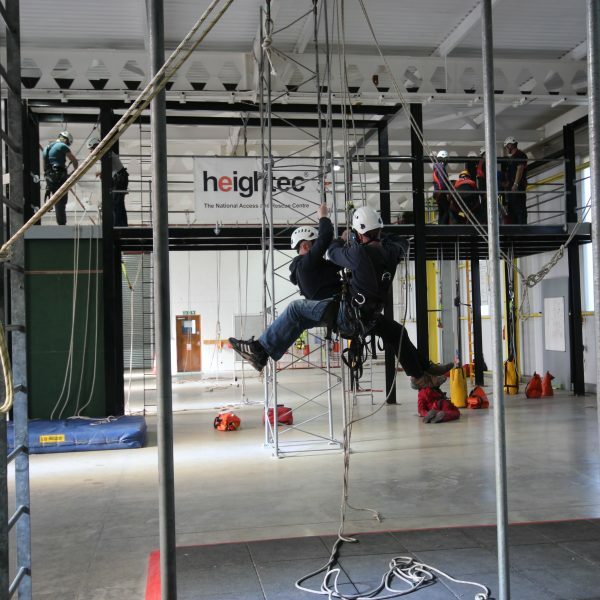 heightec – The National Access and Rescue Centre holds public and professional indemnity insurance which includes personal injury. You should be aware that not all training providers have this cover. You can take your re-assessment early: If a IRATA Rope Access Supervisor undertakes a re-assessment at the same level up to six months before their current expiry date their new expiry date will be 3 years from the last assessment expiry date. Please contact us for more information about re-assessment. Read our FAQ on IRATA & ISO Rope Access Training. Minimum age 18. Students on this course must already hold the IRATA level 2 certificate for at least 1 year and have minimum 1000 hrs experience at level 2 in a variety of situations. Candidates can now validate 6 months in advance of certificate expiry. Must be fluent in English. Physical fitness with no contra-indications for working at height. There is no weight limit imposed, however candidates must be medically and physically fit and able to haul their own body weight.